Getting to Phi Phi Island from Phuket is easy !!! A ferry is by far the cheapest and easiest way to get to Ko Phi Phi from either Phuket or Krabi. From Phuket the boat trip takes around 90 minutes, depending on conditions it can take longer. 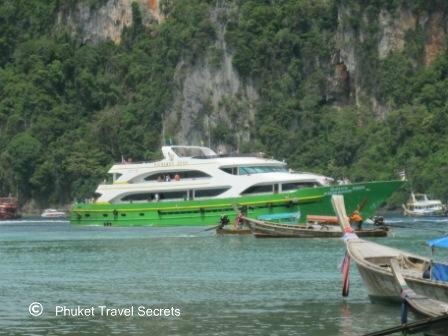 There are a few ferry companies that operate the ferry route from Phuket to the Islands. Some of these ferries have package tours which include sightseeing, snorkeling and lunch all in the one price. You can purchase your tickets for the ferry from travel agents and tour agencies in Phuket or you can contact Easy Day Thailand to assist you with booking your tickets, in turn making the process of getting to Phi Phi Island that much easier. The price of the ferry tickets vary depending on the class of ticket you choose. Land transfers are included in the cost if you are staying at one of the following areas of Phuket; such as Phuket Town, Patong, Kata or Karon Beaches. During our trips to Pee Pee, we have caught many different ferries. Two of our preferred ferries are the Royal Jet Cruiser and the Pichamon. Both ferries are great for sun lovers like us, with a large sundeck, where you can enjoy some amazing views. The Royal Jet Cruiser is awesome if you want to travel in complete comfort in the Premium Lounge. You can read more about the Jet Cruiser ferry here. The lower decks in both ferries are air conditioned with comfortable seating for passengers and there is free tea, coffee and yummy muffins available throughout the trip..
Our Transfers picked us up on time from the hotel at 7.00am and we arrived at Rassada Pier with ample time for the 8.30am ferry. Have a look at some of the video clips below. The first video is taken at Rassada Pier and on route to the Island. There was ample room on board the ferries, however this was during the low season! During the high season getting to the Islands with hoards of other tourists on board can get a bit crowded. This next video is taken when the ferry was entering Tonsai Bay. The final video is taken arriving at Ton Sai Pier and transfer to Hotel. Getting to Phi Phi Island by ferry is ideal for people that are staying overnight and for those who prefer a more comfortable voyage. For those who want to get there quicker to go on a daytrip it is best to either charter a private speed boat or book a speedboat transfer. Getting to Phi Phi Islands from Krabi is just as easy. There is a regular ferry service from Krabi to the Islands. Ferry tickets can be purchased from travel agents and tour booking offices throughout Krabi, or you can purchase your tickets online from our trusted friends at Easy Day Thailand. Return Tickets do not have to be used on the same day. All ferries to and from the islands seem to depart and arrive back at Rassada Pier in Phuket at the same time. Even in low season there are crowds of people and getting anywhere fast, just isn’t going to happen. It is advisable that you have a transfer or taxi waiting for you at the ferry terminal in Phuket, especially if you are going directly to the airport. Phuket Airport is about an hours drive from the Pier, depending on traffic conditions. To optimise your time on the islands catch the early ferry from Phuket and try to stay for at least 2 or 3 nights and then on the return journey catch the late ferry back to Phuket. Some links on this page are affiliate links, which means that if you purchase a product or service through them we may receive a very small commission at no extra cost to you. Because our integrity and your satisfaction are very important to us, we only recommend products or services that we have purchased and or used ourselves, which we believe would benefit you. To learn more please see our affiliate disclosure.